The Costa Mesa City Council will meet in a Special Meeting on Tuesday, December 9, 2014 beginning at an unusual time, 6:45 p.m., to discuss the future of Medical Marijuana ordinances in this city. There is no agenda available yet for this meeting, but the following is the complete text of the press release issued by The City this morning. NOTE: The city issued the official agenda for this meeting later this afternoon. You can read it HERE. Plus, HERE you can read the actual New Business agenda item to be considered. This report includes links to thirty-two (32) separate attachments!!! I'm not going to give you those links.. you can go there and select the ones you want on your own. You've got the weekend to do it. The Costa Mesa City Council will hold a specially scheduled meeting at 6:45 p.m. on Tuesday, Dec. 9 to review a variety of items related to two medical marijuana initiatives that have obtained enough signatures to be placed on the ballot. The council will first review a staff report that details the potential impacts that the two competing initiatives would have on the city’s various departments, including police, finance and the City Attorney’s Office. 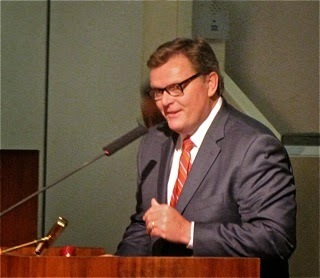 The staff report will also include the impacts of a medical marijuana ordinance proposed in August by Council Member Gary Monahan and another medical marijuana ordinance passed by Santa Ana voters in November. 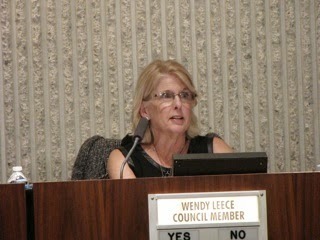 Adopting a medical marijuana ordinance (either one of the initiatives or a city-crafted ordinance). Placing the two medical marijuana ordinances on the ballot at a special election as mandated by the state election code. Placing the two medical marijuana initiatives on the ballot at the next General Election (Nov. 6, 2016) since both measures call for tax increases and the California Constitution mandates any proposed tax increases must be voted on during a General Election. Placing a third medical marijuana measure—one crafted by the City Council—on the ballot to compete with the two initiatives (if two or more of the measures pass, the one with the highest number of votes would become law) at either a special or General Election. The City Council meeting will begin with a closed session. The public portion of the meeting is scheduled to begin at 7 p.m.
You will recall we've written about this recently, HERE. The major problem - aside from Medical Marijuana being sold in the city at all - is the fact that both the initiatives that qualified to be placed before the voters include taxation elements that really complicate the issues. The council, in a previous meeting, decided to have the staff study the issues, and that analysis had to be completed within 30 days, hence this special meeting. If the city places the items - and perhaps another city-generated similar item - on a special election ballot, that might be violating one law because of the taxation element - which is required to be on the ballot of a General Election, which would be November, 2016. If they fail to place it on a Special Election ballot it violates another law. 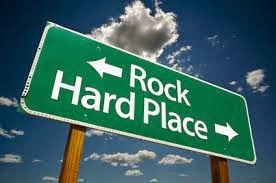 Rock, meet Hard Place! I expect this meeting to be heavily-attended, both by proponents and opponents of the issue. I'm especially interested to hear what our public safety folks have to say, since they were not consulted when councilman Gary Monahan cobbled together his ordinance with the City Attorney earlier this year. And, I'm going to be very interested to see how rookie Mayor, Steve Mensinger, manages this meeting. Theoretically, this will be the final City Council meeting of this calendar year. The next scheduled meeting is Tuesday, January 6, 2015. 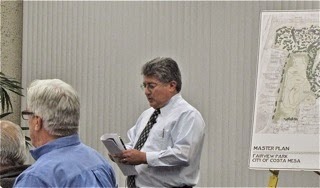 The Costa Mesa Planning Commission, "guided" by Chairman Jim Fitzpatrick, meets for their final time this year on Monday, December 8, 2014 with an agenda that is certain to provide some controversy. You can read it HERE. The meeting begins at 6:00 p.m. in City Council Chambers at City Hall. Although they will only hold one meeting this month, this highest paid Planning Commission in Orange County will get their full $400 per month stipend... Merry Christmas, guys! Right off the bat the Consent Calendar - items that theoretically can be considered without discussion with one vote - includes a couple items that might generate a request for separate review/discussion before the vote. 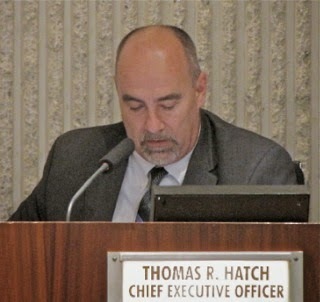 #2, HERE, is an update on the smart phone app, Costa Mesa Connect and Nuisance Abatement Ordinance, Sober Living Ordinance(s) for R2 and R3 zones and recent motel inspection data. Lots of information in there that will probably get some attention from members of the public. #3, HERE, is the discussion of the SOBECA Traffic and Parking Study. According to the staff report, there's now too much of the former and not enough of the latter. Attendees might wish to hear this issue expanded upon, too. There are five (5) public hearings on the agenda, but the first one, HERE, involving Scooter Sales, has been removed for later consideration. 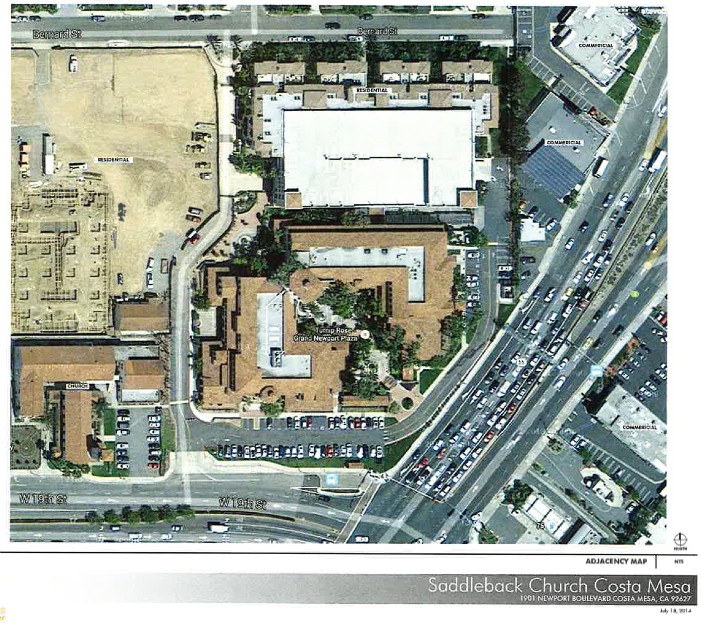 Public Hearing #3, HERE, is the request by Saddleback Church to use a big chunk of space in the building at 1901 Newport Blvd. for church meeting and administrative purposes. That 207 page staff report provides enough information and conditions for the staff to recommend approval. 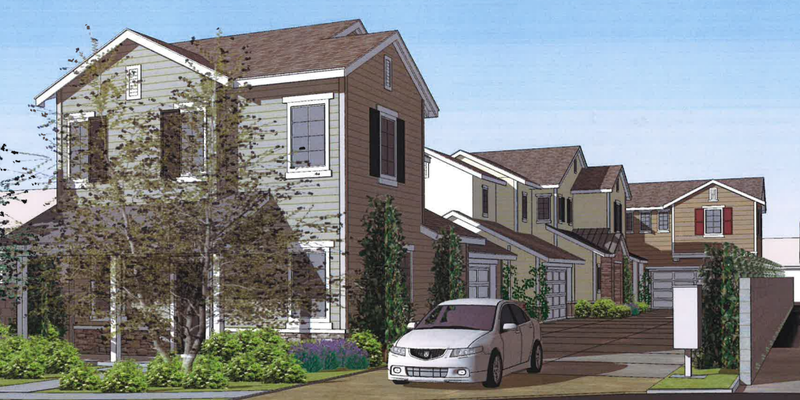 Public Hearing #4, HERE, is a 3-unit detached residential development at 1817 Viola Place that includes a handful of variances, administrative adjustments and minor modifications. I thought our Small Lot Ordinance was supposed to do away with all that stuff! 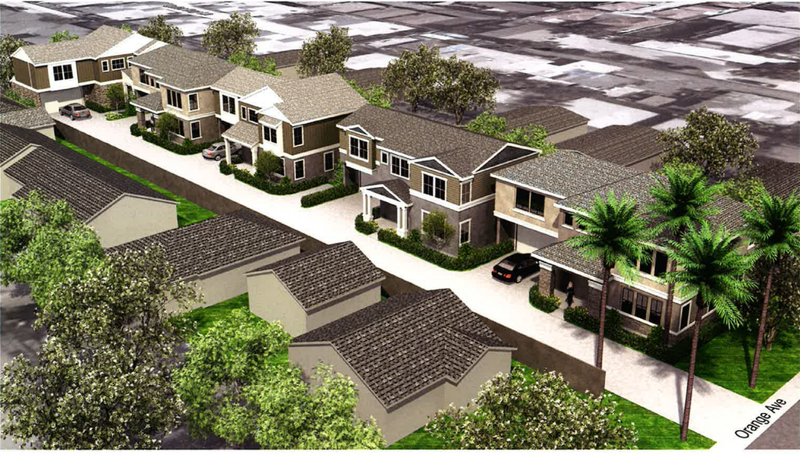 The final Public Hearing, #5, HERE, is for a 5-unit residential development at 2661 Orange Avenue. This, also, includes variances and divides the 19,800 square foot lot into five (5) fee simple lots. The Planning Commission will next meet on January 12, 2015 to begin another year of rampant development throughout the city. The Fairview Park Citizens Advisory Committee met again last night and the rainy weather kept the crowds down. 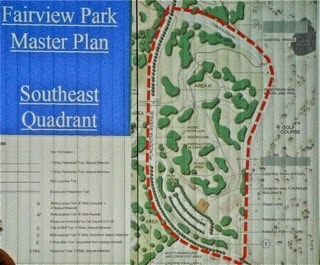 This meeting was the continuation of the discussion of the Southeast Quadrant of the park. Fewer than 30 people attended the meeting, but many were active participants in the process. Vice Chair Steve Smith did not attend, member Brett Eckles made it a little late, as did brand new Mayor Steve Mensinger, who is the primary City Council representative. 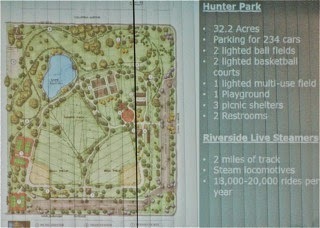 Parks Project Manager Bart Mejia led off with a brief summary report of the field trip the committee took to Riverside's Hunter Park, home of the Riverside Live Steamers, a facility that blends active recreation uses with a model train ride. If you want to see what that park is like, view a YouTube clip, HERE. A half-dozen speakers addressed the issue - which apparently was intended to provide perspective for the possibility of mixing similar uses in Fairview Park. Without exception they felt mixing playing fields with the area currently occupied by the Orange County Model Engineers is a bad idea. 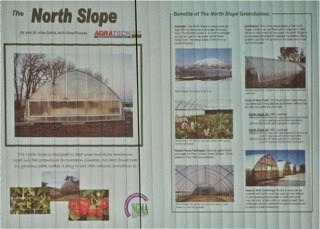 There was to have been some kind a presentation by someone named Bill LeValley about a Native Plant Nursery, but he didn't show up. Later we learned from a commenter that he actually runs a nursery somewhere. Parks and Recreation Commissioner Bob Graham, on crutches nursing a wounded Achilles Tendon and speaking not as a commissioner but as a private citizen, made a pitch for a bike path that would skirt the perimeter of the north part of Fairview Park, using right-of-way near the Fairview Channel and eventually wind around and connect with the Joann Street Bike Path. Although it is not clear that the County of Orange would be interested in participating, the committee voted unanimously to agendize the item for further discussion. 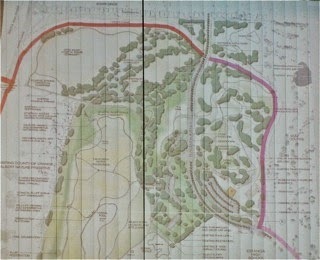 Old Business #1 was the discussion of the creation of a Native Plant Nursery in the Southeast Quadrant of the park. 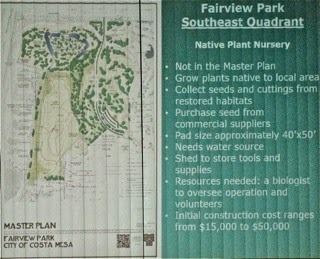 The idea would be to propagate Fairview Park native plants to be used later to rehabilitate areas of the park with such a need. 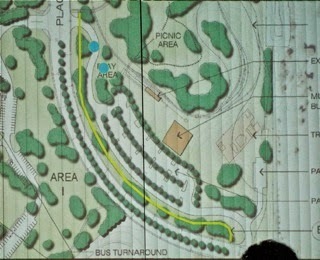 Mejia described in general terms the scope, cost and possible locations for such a facility in the park. The image provided shows the main points. Nine people spoke to this issue, including resident Cindy Black, who was the prime mover of this idea from the beginning. After some significant discussion the committee voted unanimously to move this idea forward. The preferred location would be adjacent to the OCME site - visible from the street for security purposes and with easy access to water, power and parking. Next up was the discussion of the Improvement/Designation of Bike Paths within the park. 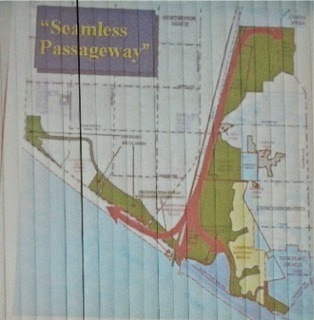 There already exists a plan for a bike path in the current Master Plan, shown as a yellow line below. After a few minutes of discussion, and considering that they had already agreed to move Graham's idea forward, the suggestion to move this item forward died for lack of a motion. 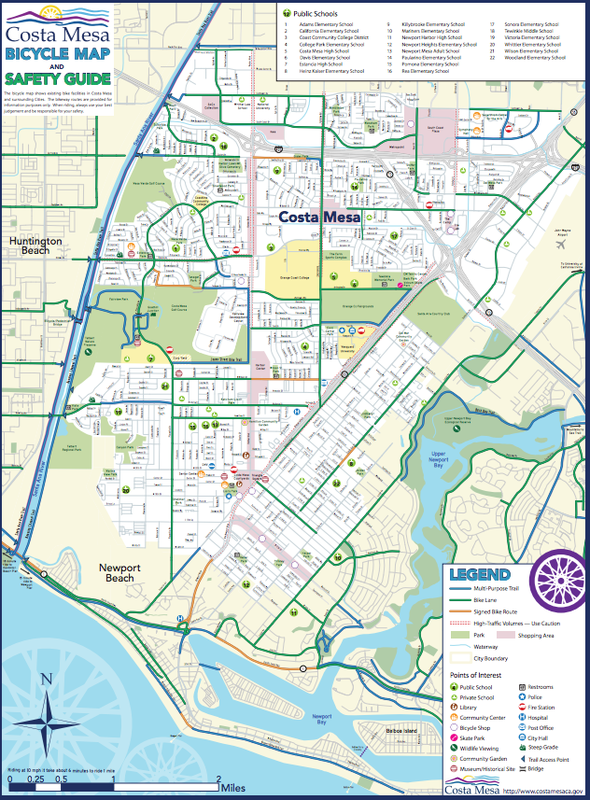 Below is the current map of Costa Mesa Bike Paths from the City website. It you wish to see the larger version of the map click HERE. The meeting began shortly after 6:00 p.m. following a closed session to discuss several law suits. It just wouldn't be a council meeting without lawsuits being discussed these days. Following the Pledge of Allegiance, led by termed-out council woman Wendy Leece, Pastor Mike Decker led the moment of solemn expression and called for conciliation and a return to more civil times. Sounded like a good idea at the time. Three hours later we found out that it's going to be business as usual. How very sad for the city. The meeting played to a Standing Room Only crowd, about equally mixed with Righeimer supporters and Foley fans. We found that out at one point when the two factions sniped at each other. 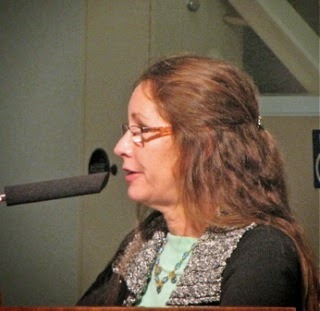 During Public Comments seventeen (17) speakers stepped up to address the council. Almost all of them thanked Leece for her decades of service and many also thanked Police Chief Tom Gazsi, who is leaving next week for a very important job with the Los Angeles Port Police Department. 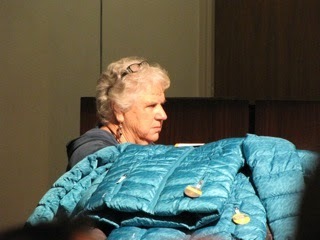 More than a few hauled coats to the dais as an "in-your-face" statement to Righeimer, who earlier had protested the collection of warm coats for needy Costa Mesa children - a program Katrina Foley has sponsored for years. It was clear by evening's end that the backlash generated many more coats than anticipated. 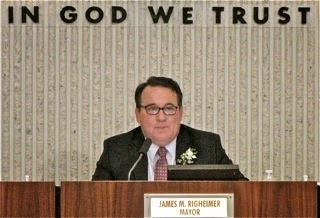 One had to smile at the political gaffe by Righeimer, who fancies himself a first-class politician. A couple speakers called for Mensinger and Righeimer to abandon their lawsuit as a sign of good faith. I smiled. Others demanded action on the sober living home problem and observed that we already have two lawsuits and the applications still are not ready for the operators to obtain. 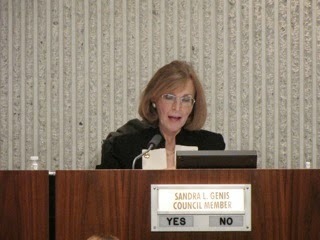 During Council Member Comments Sandra Genis led off with a statement about her disappointment with the rhetoric following the last election - the one in which she was the highest vote-getter. At that time, she said, she hoped for some sign of a willingness to consider all views and to work together. She told us she gave it three months, by which time she realized that cooperation was not going to be happening. She called for a "goal-setting" meeting by the council so a road map of their direction could be determined - and perhaps find common ground. She also praised Leece and Gazsi. 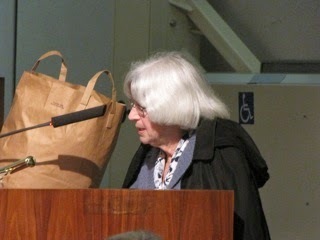 Leece came next and addressed the coat drive - holding up a gently-used coat donated by her grandson. 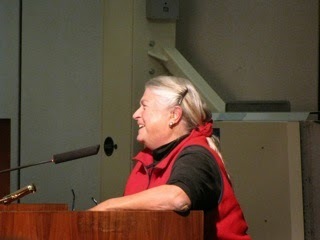 She told the audience we had been blessed by the presence of Tom Gazsi as Police Chief and wished him luck. She also called for the abandonment of the lawsuit. 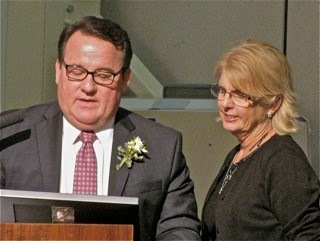 Gary Monahan thanked Gazsi and Leece and welcomed Foley back to the dais. Righeimer spoke next and asked CEO Tom Hatch for an update on the sober living home issue. He then whined about all the tough issues they face, including the Pension Liability issue, stating - again - that it was a state-wide problem and that the State is going to have to step in, but it will take a couple more cities to go bankrupt for that to happen. Parts of the crowd grumbled at that one. He then complimented Leece for her service, stating that he enjoyed working with her. I smiled, because his definition of "working with" is very different than mine. In the case of Leece, his means "ignoring you all the time". Righeimer then launched off on a mini-tirade about the lawsuit. He attempted to portray the Costa Mesa Police Association as bullies and extortionists, citing actions by the law firm they had employed. He told us he and his wife didn't need this - the lawsuit. 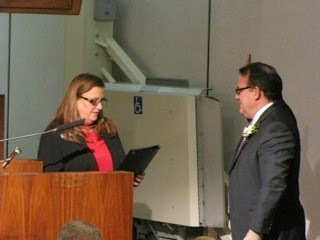 Then Righeimer summoned Gazsi to the speaker's podium, where he proceeded to present him with a proclamation about his service to the community. Gazsi received a standing ovation, then delivered one of the best, most inspirational speeches I can recall, citing the outstanding men and women of the department, the standards set by previous chiefs, and much, much more. Then it was Mensinger's turn. He congratulated Foley on her victory and Leece and Gazsi for their service. He then also addressed the lawsuit and complained about how hard it is for his children to hear bad things said about him. 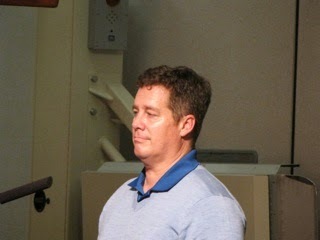 He emphasized that he will NEVER abandon the lawsuit. During his segment Hatch also praised Gazsi and, at one point, said, "I love you, Tom." He then turned to the Medical Marijuana issue. He affirmed that there will be a meeting next Tuesday - the 9th - at which the sole issue will be the various elements of the Medical Marijuana situation. There are two competing initiatives, plus Monahan's previous scheme Plus the possibility of a special election OR waiting for the General Election in two years. That meeting starts at 6:45 p.m., although there will be a closed session at that time, so the actual start time of the open meeting is unclear. 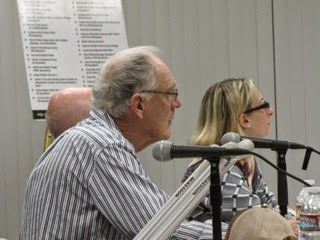 He stressed the need for community input at the meeting. Hatch then turned to the sober living home issue and confirmed two lawsuits have been filed so far because of the new ordinance. He also confirmed that there have been "unfortunate" delays in getting the applications prepared for distribution to willing operators. 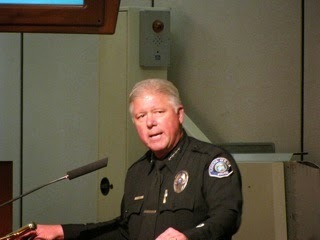 He also emphasized the need for "a lot of Code Enforcement" presence to enforce the ordinance. He said it is his "top priority", and stressed the recent events on Senate Street where a dozen beds were seen being taken into a home that had just been investigated - citing citizen involvement by providing photos showing the activity. Finally, at 7:30, we finally got around to the main issue at hand - the certification of the election results and the election of a new mayor and mayor pro tem. Ten individuals spoke on this issue, most of them off the mark. Many thanked Leece and Gazsi for their service. Gene Hutchins continued to express concern about the failure of Measure O, and complained about the unfunded pension liability - again. Cindy Black presented comic books to each of the council members the stars of which she said represented each of the council members. I smiled. Greg Ridge complained about Measure P, the confusing ballot measure about the I-405 toll lanes. He told the City Attorney, Tom Duarte, that it never should have appeared on the ballot that way. 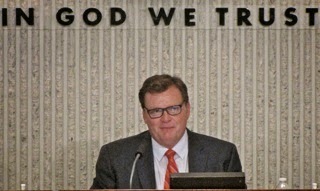 He then observed that the council sits before a wall on which the words "In God We Trust" are embossed and suggested those words are on the wrong wall - they should be on the back wall where the council can see them. 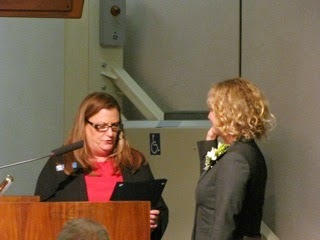 Righeimer then guided the presentation of a proclamation to Leece for her service. Leece then took the opportunity to introduce her family and showed slides. In addition to the proclamation presented by Righeimer, she also received acknowledgment by the city staff, presented by Hatch; a photo album presented by the 5th floor support staff; the Orange County library staff for her involvement in library issues; Think Together, for her involvement in education; Orange County Vector Control, for her active participation and support of that group; Hank Lloyd from the Costa Mesa Tennis Center recognized her help getting professional tennis to the city; Moorlach stepped up, gave her a BIG hug (I thought we'd have to turn a hose on them!) and recounted their long relationship and praised her for her service to the community and Robin Leffler made a presentation from Costa Mesans For Responsible Government for her activism and support for the community. 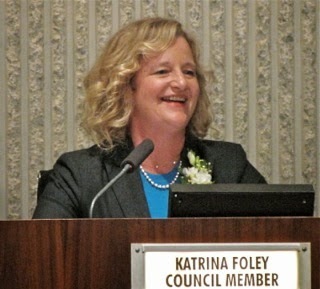 At 8:20 we got around to swearing-in Katrina Foley - the highest vote-getter in this election by far. Following that procedure by City Clerk Brenda Green, Foley took a seat on the dais and proceeded to thank her supporters, her office staff and her family. She told the audience that many folks have high expectations for her on the council and she's not sure she can meet all of them. She hopes to find ways to collaborate with the other council members and called for a toning down of the rhetoric and vitriol that marked the campaign - on both sides. She asked HER supporters to give it three months - to address facts, but not with rancor. She said "We're all in this car pool together". She encouraged speakers to come to the meetings and focus on facts and to join her in bringing civility back to government. 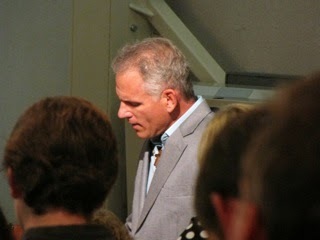 At 8:35 Righeimer - who beat Jay Humhprey by only 47 votes - was sworn-in by Green and thanked "everyone for being here". He said "my kids are getting an education". He thanked his wife and daughters, Mensinger and his wife, Robin and his staff, including Jon Fleishman (who publishes the FlashReport - a conservative newsletter). 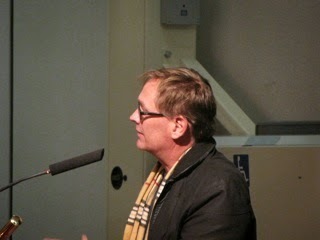 He thanked some supporters in the audience and the city staff. Righeimer told us the City is in "real good shape". Then said, "Let's all just work together. ", observing that the campaign is over and addressed the acrimony on Facebook that has marked this campaign. He said, "We agree on 95% of the stuff and the other 5% is important." I'm not sure what he meant by that, since most of what they work on is important to somebody in the city. Maybe he meant that 5% was important to him and the rest, not so much. Before the election of officers there were three speakers. 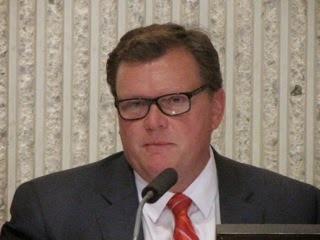 Gene Hutchins suggested the continuation of Righeimer as mayor. 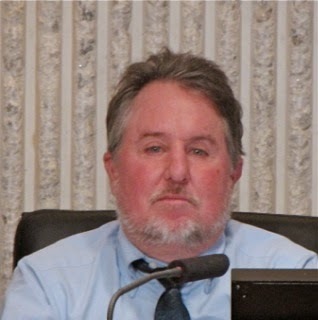 Planning Commission Chairman Jim Fitzpatrick - who recently called for the City to "do something" about this blog on Facebook - stepped to the podium and told us he referred to Righeimer as "Black Jack Riggy" because of how the votes shifted during the counting process. A strange comment, for sure. Anyhow, he supported Mensinger for mayor, citing him dragging Fitzpatrick away from work (does he have a job?) to go look at a development as a reason to consider him for mayor. Fitzy is a strange guy... Colin McCarthy suggested that they get back to the previous practice and rotate the Mayor Pro Tem into the mayor's slot. He suggested Mensinger for the job and cited a "seamless transition"... I smiled. Then came the nominations. Genis nominated Foley for Mayor, citing her prior service, legal training and that she was the top vote-getter in the election. After a pause during which there was no second forthcoming Foley spoke up and said she didn't feel right about seconding that nomination and that she supported the rotation concept and would support Mensinger for mayor if he was nominated. 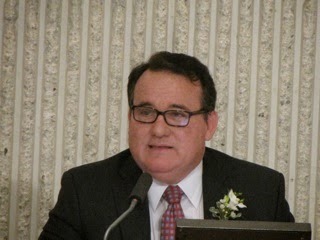 Monahan nominated Mensinger and Righeimer immediately seconded his nomination. 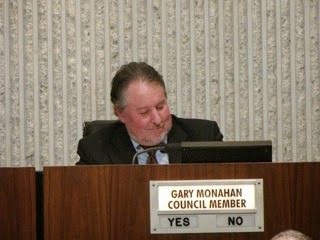 At 8:55 Steve Mensinger was elected Mayor of the City of Costa Mesa on a 5-0 vote. He then proceded to thank his family - his parents flew down from northern California for the event. He mentioned his liberal aunt Peggy - a legend in Modesto where she was an extremely effective council member. At 9:00 Monahan nominated Righeimer for Mayor Pro Tem and Mensinger seconded. Foley nominated Genis, citing the fact that she was experienced, next in the rotation and that her appointment to the position would be a show of good faith in the spirit of cooperation called for earlier by both sides. She hoped one of the members would second her nomination. When none was forthcoming Genis observed that two years ago it took her three months to understand the situation on the dais, but that she's learning much quicker this time around. (It only took 5 minutes this time!) The vote was called and Righeimer was elected Mayor Pro Tem on a 3-2 vote - Foley and Genis voted NO. And so it begins... so much for that spirit of cooperation. The two candidates in the last two elections who received the greatest number of votes - by far - were shut out of leadership positions. I suspect, though, this time around it's going to be very different. Foley will NOT sit quietly by as the male majority runs roughshod over the rules. Mensinger then issued a proclamation to outgoing Mayor Righeimer and asked Moorlach to help. Moorlach used that opportunity to, instead, thank Gazsi for his service and recounted their long friendship to the audience. 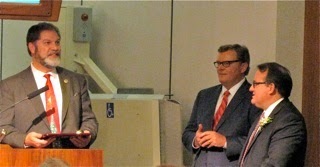 As an aside, when Mensinger asked Moorlach to step to the podium he identified him as "hopefully our next Senator from California". Poor guy is clueless! Moorlach is running for the California State Senate! It's going to be a long, long couple of years with Mensinger at the helm. Somebody better find a tutor for him - quick! A reception was held for the new council members in Conference Room 1A, which seemed to be sparsely attended when I wandered through. Next Tuesday they get down to business on the Medical Marijuana issue - and it's not going to be pretty. See you there. Oh, yes... Katrina's Coat Drive appeared to be a huge success. This photo shows only those hauled up to the City Council Chambers porch. Others left their's in the car. One person had 48 coats she had collected from friends and neighbors in her car. A big shout-out to Righeimer for his ham-handed handling of this issue which gave it MUCH MORE publicity than it might have otherwise gotten.